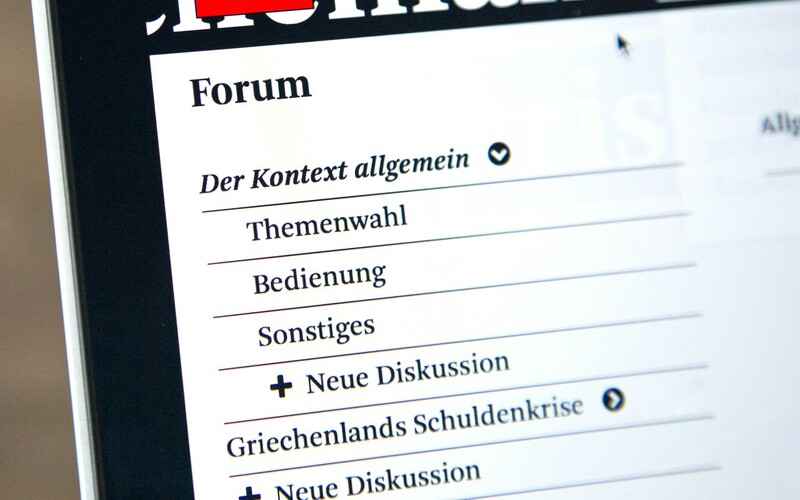 In mid-July 2015, “Der Kontext” (“The Context”) became one of the first startups to move into the new Media Lab Bayern in Munich. 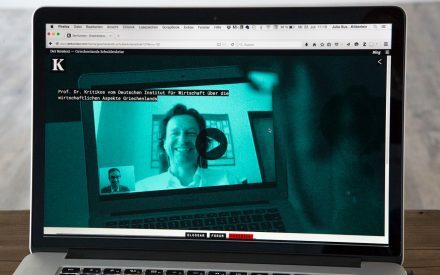 Operated by Bavaria’s new media watchdog BLM, the incubator and co-working space provides selected teams with office space, coaching, contact with other startups and media professionals, plus a host of other forms of support. What is “Der Kontext” all about? 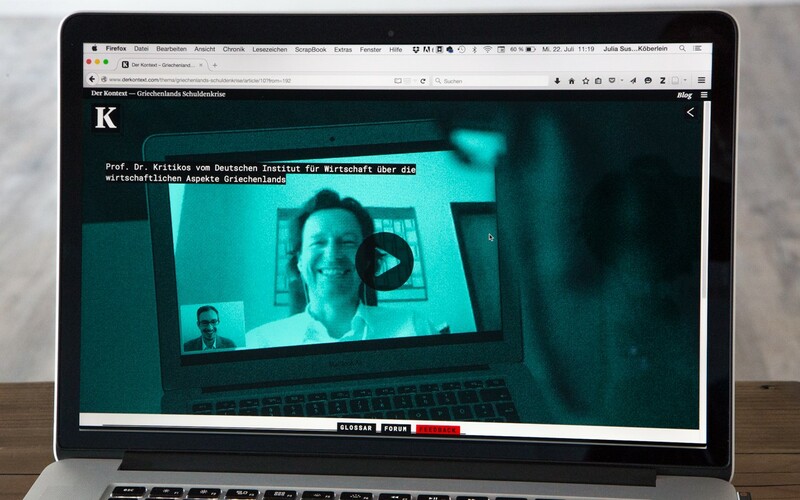 Kontextlab GmbH founders Bernhard and Julia, ably assisted by web specialist and programmer Erich, aim to provide their users with an online background magazine whose hallmark is meticulous journalistic editing. Where did the idea come from? The founders point to the daily flood of information that media users are no longer able to cope with – a situation which makes it difficult to identify all the relevant background information and understand issues in their wider context. 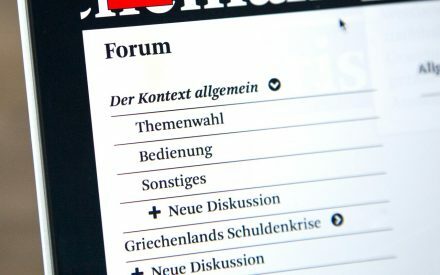 That is exactly why Der Kontext focuses on one special, professionally edited topic each month – the Greek crisis, for example. An array of content is gathered and reliable sources are used: “We interview subject area specialists who really know what they are talking about,” Bernhard explains, “and we enrich their input with articles, facts, even suitable cultural content – such as a photographic series documenting graffiti in Athens.” The medium certainly has no lack of authenticity and expertise. Users can play an active part in choosing the topics covered, expressing their preference for one of several subjects proposed by the editors and thus voting on the theme of the next issue. Readers are also encouraged to supply the editorial team with comments and ideas by e‑mail, using a feedback form and via social media. The magazine is structured along the lines of familiar navigation programs to ensure ease of use. Programmer Erich developed a brand-new web concept specially for this medium, allowing users to dive ever deeper into the web of information and go on their own journey of discovery through articles, videos, audio files, interviews and all kinds of other multimedia offerings. Full access to the magazine will probably be available as a subscription service. For everyone who signs up for derkontext.com now, the first few topics will be free of charge. It has not yet been decided when the payment model will be introduced. Julia fleshed out the basic concept behind Der Kontext as early as 2009, albeit as a print version back then. Accolades such as the European Newspaper Design Award and a nomination for the Bavarian National Award followed in 2010. In the years that followed, the founders actively solicited feedback from respected journalists and publishers. The project met with excited enthusiasm from many quarters. Buoyed by the positive echo, Julia and Bernhard applied for an EXIST grant – and were given the nod in 2014. This had two specific consequences: One was that financial stability was guaranteed for a year. The other was that the fledgling team was able to learn a lot from other EXIST teams too. “Precisely because many teams had completely different approaches and specialized in other fields, their perspectives again and again gave us very interesting feedback for our startup,” Julia says. The grant program also provided the two founders with all kinds of assistance to get them in shape to run a business: “The coaching sessions were extremely helpful – especially regarding how we wanted to earn money, how to cost things accurately, how to prepare a business plan in the first place, and so on. The advice we received was really excellent,” Bernhard adds. As soon as the EXIST grant had run its course, the young company moved on seamlessly to its next round of government assistance: Since July 2015, the team from Der Kontext have been working from their new office at Media Lab Bayern, which supplies them with financial support and advice on unanswered questions in addition to high-quality business premises. The new venue also puts them in the company of other creative minds in neighboring offices. Ideas and feedback can be shared at any time, generating valuable synergies. Perhaps most importantly of all, Der Kontext is gaining popularity among its users. And the sky is the limit. Although it would be possible to press ahead with development and operation in a small team, the startup is currently looking for a business angel to continue to advance the magazine. The founders’ preferred option would be an angel with proven experience in both conventional and digital publishing. Initial interest has already been signaled. Munich Startup wishes Der Kontext every success and will be excited to see how things unfold.